Glacier Bay National Park and Preserve and remote wilderness exploration highlight this 8-day Northern Passages and Glacier Bay small ship cruise. Sail between Juneau and Sitka, Alaska, with multiple days spent exploring inside Glacier Bay National Park with a National Park Ranger aboard for the duration to provide interpretation on the park’s history, culture, geography, flora and fauna. The park ranger, along with shipboard expedition guides, leads guests on hiking and kayaking expeditions within Glacier Bay. Other areas explored include Icy Strait, Chichagof Island and Peril Strait. Hikes and kayaking excursions are available for all levels. Other adventure activities include stand-up paddle boarding, skiff explorations and whale watching. Flexible itineraries allow your small ship to seek out wildlife and maximize viewing time for guests. Choose from departures aboard the 60-guest Wilderness Adventurer, 74-guest Wilderness Explorer and 76-guest Wilderness Discoverer. Outside of Glacier Bay, cruise through the largest national forest in the United States - home to grizzly bears, black bears, mountain goats, bald eagles and wolves. 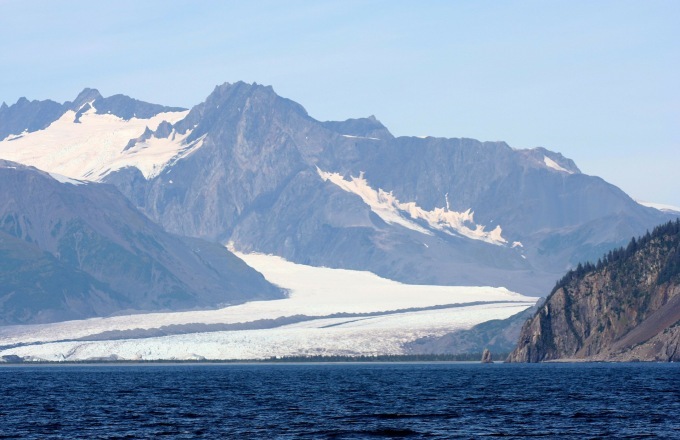 View Alaska's massive glaciers, and enter some of the world's deepest fjords to hike and kayak where other ships cannot reach. The Northern Passages and Glacier Bay itinerary can be combined with the Eastern Coves or Western Coves itinerary for a two or three week adventure with no repeated landing sites. Upon boarding, the Captain and crew welcome you aboard with smiles and a cocktail. Embark to cruise the scenic channels of the Inside Passage. One of America’s crown jewel national parks is yours to explore and marvel at for the next two days. At Glacier Bay National Park, a UNESCO Heritage Site and Biosphere Reserve, you’ll pick up the National Park Ranger who will be with you to explore coves and corners of the bay that most visitors miss. The park itself is 3.2 million acres (a little larger than the state of Connecticut), so there is plenty to see. Tidewater glaciers sweep like rivers of ice down massive mountain valleys, terminating before you in the waters of Glacier Bay. Linger near South Marble Island to spot the many species of rare seabirds that call this area home. Keep your eyes on the water and the island for brightly-colored puffins and black oystercatchers. Stop in Bartlett Cove for a visit to the Park Service's headquarters. Paddle a kayak and be awed at the face of a massive glacier. Go on a boot-sucking trek through sandbars and rainforest. And ride a skiff along shore for an up-close exploration of Glacier Bay. You'll find sea lions, mountain goats, sea otters, bears, moose, eagles, and spectacular scenic backdrops. Set your course for arguably the richest whale waters in Southeast Alaska. Join the Captain on the bridge or the Expedition Leader out on deck in search of marine mammals, primarily in the Icy Strait/Pt. Adolphus area. Then, set off for a more intimate land and sea exploration via skiffs for a closer inspection of the remote coastline, with eyes set on the shoreline for possible bear sightings. Today meander along the “waterfall coast” of Chichagof Island. With no binding agenda, marvel at the grand scenery of Alaska as our crew expertly guides you through those “not in the guide book” areas and fjords. This evening might conclude at anchor in a remote shelter, possibly Red Bluff Bay, providing another grand opportunity to lower the kayaks and skiffs, keeping your eyes open for sea otters and bears nearby. Explore the forest and shoreline on an intertidal walk. Enjoy another delectable dinner on board and relax in the hot tub before calling it a day. Today's agenda is flexible. Perhaps you'll explore a tidal inlet by kayak, feel the burn of a rain forest hike or maybe you'll have the opportunity to smell the breath of a humpback while skiffing in a secluded cove. The possibilities are endless—your Captain knows best. Peril Strait runs a total of 50 miles from Chatham Strait to Salisbury Sound. This haven for small ships is scenically highlighted by a very narrow connecting passageway called Sergius Narrows and an opening at Hoonah Sound as it reaches north and then west toward Sitka. Spend the bulk of the day exploring the shoreline for bear and the waters for otters, whales and more. This wildlife-rich waterway separating Chichagof and Baranof Islands is a great place to watch for eagles perched on trees along the shore. The passage narrows to only 300 feet in one spot (24 feet deep). After an adventurous, but “un-perilous” day, toast your voyage with a festive Farewell Dinner and “photo journal” of your trip presented by your Expedition Leaders. Gather for breakfast this morning as you cruise the final leg of your journey to Russian-influenced Sitka, Alaska, for disembarkation. A transfer will be provided to your hotel or to the Sitka airport for your flight home. The original M/V Wilderness Explorer (under the direction of AdventureSmith founder Todd Smith) pioneered adventure cruising in Southeast Alaska in the 1990s. Refurbished in 2011, the former Spirit of Discovery was relaunched in 2012 as a new-generation Wilderness Explorer offering a level of service and comfort far superior to the original. Affectionately and appropriately call a “floating base camp,” the 76-guest Wilderness Explorer is perfectly designed for remote exploration of wild places. Queen or twin beds; private bath with shower; view window. Lounge Deck and Sun Deck cabins are 92 square feet with outside deck entry, and Main Deck cabins are 110 square feet with interior hallway entry. Note that Main Deck Trailblazer cabins (#104-106) have fixed twin beds. Queen or twin beds; private bath with shower; view window; interior hallway entry. 104 square feet. Fixed queen beds; sitting area; refrigerator; private bath with shower; large picture window; outside deck entry. 126 square feet. Kids 8 years and older are welcomed aboard all departure dates; exceptions for children 7 years and under may be allowed with special pre-approval. Save $500 per child, ages 8 to 13, with the exception of holiday departures. The client must obtain and have possession of a valid passport, all visas, permits and certificates, and vaccination certificates, required for the entire tour. The client accepts responsibility for obtaining these documents and any other necessary documents. It is the client’s responsibility to assure that the name on your airline ticket, cruise tickets, or any other travel documents matches your name as printed in your passport (or domestic identification, where applicable) by providing the exact name as it appears on your passport (or domestic identification, where applicable) to AdventureSmith Explorations before tickets are issued. Once we have received your deposit and all signed Traveler Information Forms, we will send you a comprehensive Adventure Planner dossier. This contains our exclusive AdventureSmith Explorations destination handbook, map, immunization information, visa and permit information, a travel insurance application, packing list, reading list, etc. You will also receive a final tour packet (which may be provided electronically) including final reminders and local contact information for your destination, and, where applicable, tickets and vouchers, 2-3 weeks prior to the Trip Start Date. Information or advice given by AdventureSmith Explorations on visas, vaccinations, climate, clothing, baggage, special equipment, etc. is provided as an aid to you but AdventureSmith Explorations does not warrant or guarantee the accuracy or applicability of this information. You are responsible for confirming the applicability and accuracy of all such information necessary for your travel.